Eight years ago, the cost of a gallon of gas was $2.73, SpaceX successfully launched a Dragon capsule… and BestWebSoft was born. 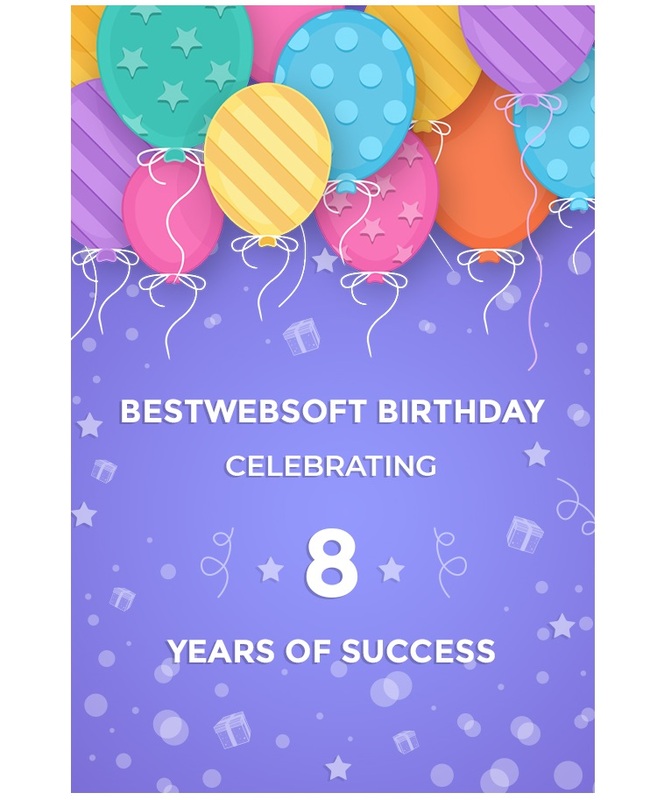 Indeed, BestWebSoft is celebrating its 8th birthday! We were founded eight years ago this very week when our three co-founders started a company together offering premium WordPress plugins and themes. And how far we’ve come since then! We’re proud of our support team for delivering a consistent 89% happiness rating last year. They answered nearly 15,500 tickets — an enormous feat to be sure. We introduced Captcha and reCAPTCHA, our best plugins for WordPress, only four years ago. After just a short time, we’ve found that more than 100,000 people chose reCAPTCHA plugin as a spam shield for their websites. The same number for our Contact Form plugin, which shows stability and simplicity. We also released the Membership program with all current and future products included into one package. The most beneficial offer so far, actually – it gives you access to unlimited usage of all BestWebSoft plugins and themes we sell today and will sell tomorrow. In our opinion, it’s simply a brutally effective deal. That’s eight years of BestWebSoft for you! Has BestWebSoft Plugins or Themes helped you start something? Do you have a favorite product? We’d love to hear it. Those of us here at BestWebSoft would like to thank you, our customers, for flying with us for the last eight years. It’s been a fun trip, and we’re so grateful to all of you for supporting us through our journey. We’re excited to see what the next eight years hold!